The Department won the 2018 Summit on Out-of-School Learning and received an award of $2,500. The Community Unity - Neighborhood Family Fun Nights program, an extension of the Partner Officer Program, was one of five finalists in the Out-of-School Champions Showcase. 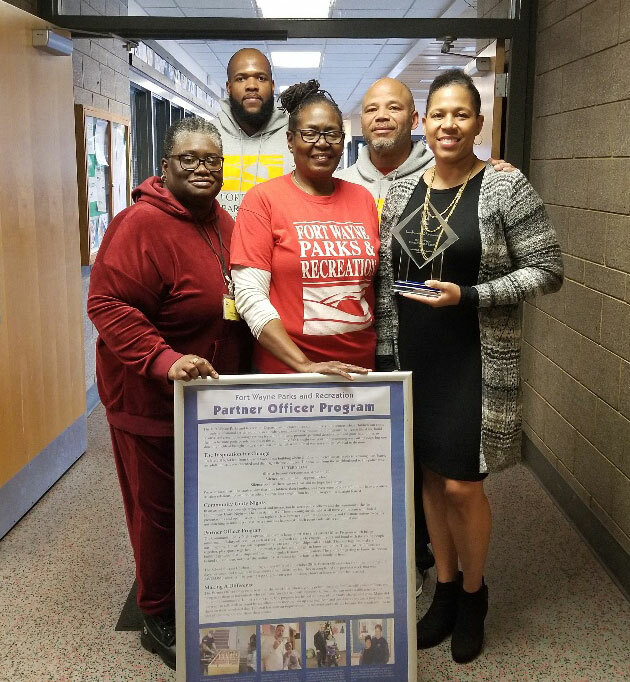 Community Unity is a partnership between the Fort Wayne Police Department, Fort Wayne United and the Fort Wayne Parks and Recreation Department. The free program, which has been offered three times at each youth center, features a community dinner along with games and prizes for the kids. Most importantly, it provides a neighborhood safety forum where officers can interact with families in a relaxed, fun atmosphere while they share what they’re doing, and what families can do, to keep neighborhoods safe. The Fort Wayne Parks & Recreation Department’s Partner Officer Program received the Innovative Program Award during the Indiana Parks and Recreation Association (IPRA) Conference in French Lick. 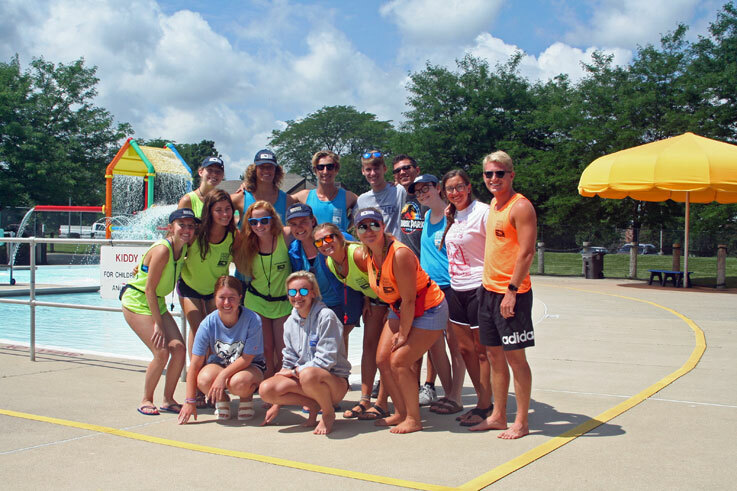 Jeff Ellis & Associates awarded the Fort Wayne Parks & Recreation Department the 2018 Platinum International Aquatics Safety Award to the Lifeguard Staff for consistently and exceeding the criteria for aquatic safety. 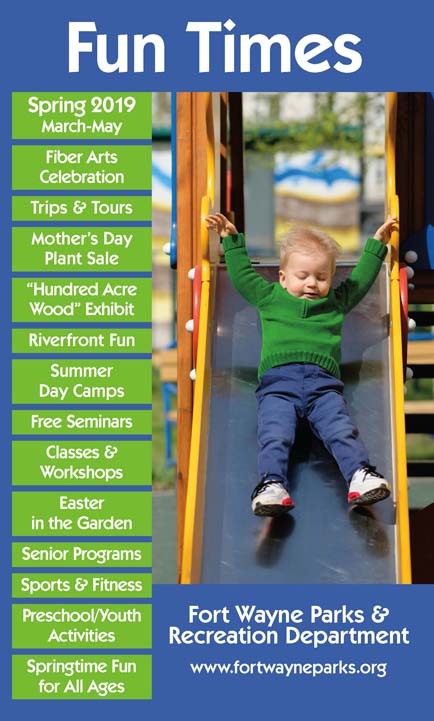 The Fort Wayne Parks and Recreation Department is pleased to announce that Franke Park Day Camp won First Place in the category “Places To Go/Things To Do/Summer Day Camp” in the Fort Wayne Newspaper’s 2018 Reader’s Choice Awards that were published on September 23, 2018, in the Journal-Gazette! Recently The Memorial Grove in Memorial Park was given the 100 Cities/100 Memorials Award. The award was a collaborative effort with the Allen County Council of Veteran’s Organizations & the Fort Wayne Parks & Recreation Department. Tree City USA-29th year! Fort Wayne has been named a “Tree City USA” for the 29th year in a row. This designation--awarded by the Arbor Day Foundation in cooperation with the USDA Forest Service and the National Association of State Foresters--was earned for the City of Fort Wayne’s tree canopy stewardship and continued commitment to a green city. Fort Wayne also earned their 14th Growth Award from the National Arbor Day Foundation for a higher standard of forestry management of the City’s 65,000 public trees. The Indiana Park & Recreation Association presented the Fort Wayne Parks & Recreation Department with two awards. Unwind Your Mind program received the Innovative Program Award and the Food Service Program was awarded the Innovative Community Service Award. Unwind Your Mind offers classes and activities for people with early signs of dementia at the Community Center downtown. A diagnosis of Alzheimer’s disease or other dementia is life changing. Since individuals with dementia often feel isolated and disconnected, it is important that opportunities to participate in community activities that are meaningful, creative and social are made available to them. Such activity can provide a sense of competence, a reduction in depression, and improved relationships with family members. Studies have shown that arts, crafts, computers and social activities help slow mild cognitive loss by up to 50%. The Food Service program serves approximately 100,000 free meals and snacks each year at its nine summer playground sites and four year-round facilities. Along with the program’s core mission of feeding children, the Food Service program is about educating children on healthy eating habits and social skills in a safe and fun environment. Fort Wayne is being honored with a Playful City USA designation for the eighth time for its efforts to make it easy for all kids to get the balanced and active play they need to thrive. 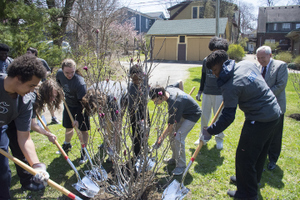 Celebrating its 11th anniversary, the national recognition program honors cities and towns across the country for making their cities more playable. Tree City USA-28th year! Fort Wayne has been named a “Tree City USA” for the 28th year in a row. This designation--awarded by the Arbor Day Foundation in cooperation with the USDA Forest Service and the National Association of State Foresters--was earned for the City of Fort Wayne’s tree canopy stewardship and continued commitment to a green city. Fort Wayne also earned their 13th Growth Award from the National Arbor Day Foundation for a higher standard of forestry management of the City’s 65,000 public trees. The Fort Wayne Parks & Recreation Aquatic staff has received the Gold International Aquatic Safety Award for their commitment to professional excellence and their desire to make a difference for those who frequent our aquatic facilities. This award is distributed by Ellis & Associates, International Aquatic Safety & Risk Management Consultants. Only lifeguards scoring in the top 30% of the audit criteria receive this award. ThreeBestRated.com rated 1) Franke Park Trail and 2) Salomon Farm Park Trail in the Top 3 Hiking Trails in Fort Wayne. ThreeBestRated uses a 50 point inspection including everything from checking customer service reviews, history, complaints, ratings, satisfaction, trust and cost to the general excellence. Salomon Farm Park and Farmers' Market was inducted into the “Green Lights Hall of Fame.” Sustainable Indiana 2016 has been working for ten years to identify and celebrate those who are taking steps to make the world a more livable place for our children’s children. Fort Wayne has been named a “Tree City USA” for the 27th year in a row. This designation--awarded by the Arbor Day Foundation in cooperation with the USDA Forest Service and the National Association of State Foresters--was earned for the City of Fort Wayne’s tree canopy stewardship and continued commitment to a green city. Fort Wayne also earned their 12th Growth Award from the National Arbor Day Foundation for a higher standard of forestry management of the City’s 65,000 public trees. The non-profit organization KaBOOM! named Fort Wayne a "2016 Playful City USA Community" again! Fort Wayne first received this designation in 2010. The Rivergreenway was chosen as #2 in the "Best Trail" category in the "Best of Indiana" contest sponsored by Visit Indiana. The Old Fort received an ARCHie award for compatible new construction for the rebuilding of the Blacksmith Shop. Playful City USA-Fort Wayne is being recognized for its efforts to make it easy for children to get balanced and active play in their daily lives, a priority for their health and well-being. Fort Wayne is the largest city in Indiana to achieve the “Playful City USA” designation with only five Hoosier cities qualifying. Nationwide, 241 cities were named a 2015 Playful City USA Community by the non-profit organization, KaBOOM! This is Fort Wayne's sixth Playful City USA designation. The City of Fort Wayne has been named a Top 10 Best Run City in America by WalletHub. In order to identify the most efficiently operated cities in America, WalletHub analyzed 65 of the most populated U.S. cities on how efficiently they spend in three key expenditure categories, including education, police, and parks and recreation. The City of Fort Wayne was named Tree City USA for the 26th consecutive year. The Fort Wayne Parks & Recreation Department received from Ellis & Associates A Gold Audit Award for the safety of our Aquatics program. The Downtown Improvement District recognized the Fort Wayne Parks & Recreation Department with an award for an outstanding commitment to Downtown Fort Wayne. Northeast Indiana Trail Riders Organization Corporate Supporter award was given to the Fort Wayne Parks & Recreation Department. 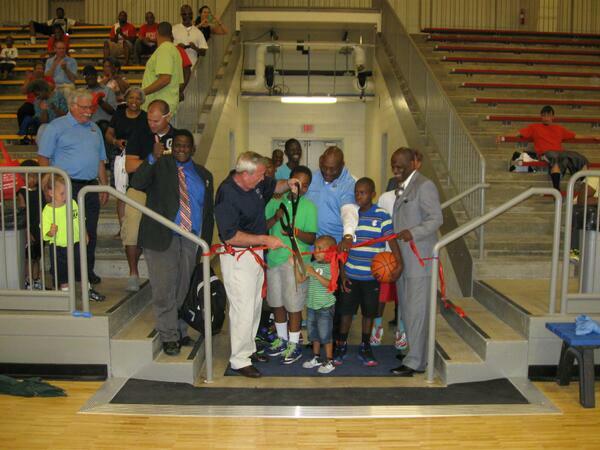 The Fort Wayne Parks and Recreation Department has been chosen as the recipient of a 2014 Awards of Excellence Award from the Indiana Park and Recreation Association (IPRA) for the McMillen Park Community Center project. The Fort Wayne Parks and Recreation Department achieved reaccreditation by the Commission for Accreditation of Park and Recreation Agencies on October 15th in Charlotte, North Carolina at The Best of the Best Ceremony as part of the National Recreation and Park Association Congress. Our Parks and Recreation Department is one of only 135 in the country to currently hold national accreditation, and one of only 41 that have been accredited for 10 years or more. Fort Wayne is also the largest organization accredited in Indiana, with Bloomington, South Bend and Carmel achieving the distinction as well. Fort Wayne is designated as the 5th Bird Town Indiana by the Indiana Audubon Society! Read more about what this designation means for Fort Wayne. Playful City USA-Fort Wayne is being recognized for its efforts to make it easy for children to get balanced and active play in their daily lives, a priority for their health and well-being. Fort Wayne is the largest city in Indiana to achieve the “Playful City USA” designation with only four Hoosier cities qualifying. 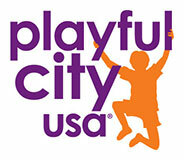 Nationwide, 212 cities were named a 2014 Playful City USA Community by the non-profit organization, KaBOOM! The National League of Cities (NLC) recognized Mayor Tom Henry and the City of Fort Wayne for completing the key health and wellness goals for Let's Move! Cities, Towns and Counties. Our city received the following medals:Bronze Medal in Goal I: Start Early, Start Smart For having an active interagency collaboration on early care and education programs. Bronze, Silver and Gold Medals in Goal II: MyPlate, Your Place For prominently displaying MyPlate in 100% of municipally or county-owned or operated venues that serve food and for registering as a MyPlate Community Partner. Bronze and Silver Medals in Goal IV: Model Food Service For adopting a policy for healthy and sustainable food service guidelines aligned with the Dietary Guidelines for Americans for municipally or county-owned or operated venues that serve food. Bronze, Silver and Gold Medals in Goal V: Active Kids at Play For mapping all playspaces, completing a needs assessment of playspaces, developing an action plan, and launching at least three proven policies, programs, or initiatives from the action plan to continue to increase access to physical activity. The City of Fort Wayne was named Tree City USA for the 25th consecutive year. Local Festivals- #1 Johnny Appleseed. The Fort Wayne Parks and Recreation Department Aquatic Operations received a Final Overall Audit Evaluation of EXCEEDS. This was the annual review conducted by Ellis & Associates- International Aquatic Safety & Risk Management Consultants. Macy’s and NRPA partnership selected Lawton Park as part of national fundraising campaign that will provide contributions to Kid’s Crossing Playground fund. The Downtown Improvement District recognized the Partners of the Planter Program for an Outstanding Commitment to Downtown Fort Wayne in 2013. Spear Corporation won a Commercial Pools Water Feature Silver Award from the Aquatec Society for the design of the waterpark at Taylor's Dream Boundless Playground. Taylor's Dream Boundless Playground was a collaborative effort with Turnstone, League for the Blind & Disabled and the Fort Wayne Park & Recreation Department. 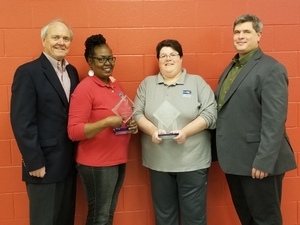 The Allen County Solid Waste Management District recognized the Fort Wayne Parks & Recreation Department at their August 28th Excellence in Recycling Awards Luncheon. The Department was recognized as a Partner since we provide community drop off sites for recycling duing the Christmas Tree Recycling program at a couple of our parks. Fort Wayne is named a 2013 Playful City USA Community by the national non-profit organization KaBOOM. Fort Wayne is being recognized for our efforts in making play a priority for the health and well-being of our children. Fort Wayne earned this distinction for the fourth year due to our outstanding dedication to increasing play opportunities for children. Fort Wayne Children's Zoo Director, Jim Anderson, was named the Association of Zoos and Aquariums' (AZA) Inspector of the Year. The City of Fort Wayne was named Tree City USA for the 24th consecutive year. In addition, the Growth Award from the National Arbor Foundation was received again. The Growth Award is earned because a city meets a higher standard for urban forestry management activities. 40% of the client base will receive this Award for 2012. The Fort Wayne Parks and Recreation Department was awarded the Building Contractors Association “Excellence in Construction Award” for Taylor’s Dream Boundless Playground. Taylor’s Dream opened in 2011 at Kreager Park and is a regional destination playground designed for children of all abilities. The BCA Excellence in Construction Award received for Taylor’s Dream was for the category of new construction under $4 million. Taylor’s Dream had been nominated by Fetters Construction for its unique character and for its key community focus. Receipt of this BCA Award is a great honor to the Fort Wayne Parks, its patrons, and all the sponsors and collaborators who came together to make this dream come true. Taylor’s Dream Boundless Playground was awarded the prestigious Daniel Flaherty Park Excellence Award at a ceremony on February 27 2012 in Angola, IN. This recognition is awarded to park facilities and programs completed in the last five years that represent the cutting edge of the leisure movement throughout the United States. Taylor’s Dream Boundless Playground represents innovation, cost effective design, demonstrates the utilization of community input and resources, and provides a significant impact on the community itself. Golf Operations Pro/Manager, Rick Hemsoth was awarded the “PGA Indiana Section Junior Golf Leader”. The City of Fort Wayne was named Tree City USA for the 23rd consecutive year. In addition, the Growth Award from the National Arbor Foundation was received again. The Growth Award is earned because a city meets a higher standard for urban forestry management activities. 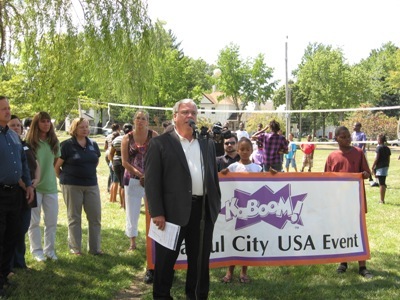 Fort Wayne is named a 2012 Playful City USA Community by the national non-profit organization KaBOOM. Fort Wayne is being recognized for our efforts in making play a priority for the health and well-being of our children. Fort Wayne earned this distinction for the third year due to our outstanding dedication to increasing play opportunities for children. Fort Wayne is one of 213 communities (out of 450 communities that expressed an interest) being recognized as a Playful City USA Community in 2012. The Fort Wayne Parks and Recreation Department received an Excellence in Design Award from the Downtown Improvement District at the annual Downtown Design Awards/Archies/AIA Design Awards. The award was for the recently completed Foellinger Freimann Botanical Conservatory Patio and Courtyard project, designed by Alec Johnson and installed by Lawnscape, Inc. In addition, we received a Golden Broom Award for Salon Park. We also received a commendation award from ARCH for their re-dedication and continuing stewardship of the Thieme Drive Overlook. The City of Fort Wayne has been recognized as the 2011 Outstanding Government Entity in Promoting the Principles of Urban Forestry in Indiana. The award was presented at the recent 21st Annual Indiana Urban Forest Council Conference at Fort Harrison State Park Inn. The Council recognized Mayor Henry’s initiative and long-term plan to deal with the Emerald Ash Borer Crisis. The Fort Wayne Parks & Recreation Department received a State Award for “Outstanding Municipality of the Year” for efforts in addressing the Emerald Ash Borer challenge. Fort Wayne is named a 2011 Playful City USA Community by the national non-profit organization KaBOOM. Fort Wayne is being recognized for our efforts in making play a priority for the health and well-being of our children. Fort Wayne earned this distinction for the second year due to our outstanding dedication to increasing play opportunities for children. 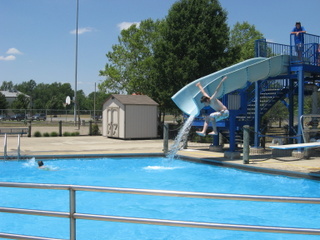 Fort Wayne is one of 151 communities being recognized as a Playful City USA Community in 2011. 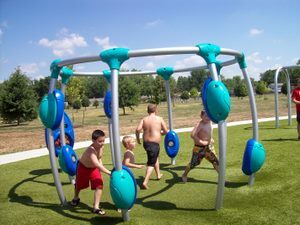 Taylor’s Dream Boundless Playground is one of two national grand prize winners of the Synthetic Turf Council’s 2011 Search for the Real Field of Dreams Contest. The playground won a $1,000 award by overcoming numerous obstacles to provide local youth with opportunities to play outside, enjoy sports and build self-esteem. The Fort Wayne Parks & Recreation Aquatic staff has received the Gold International Aquatic Safety Award for their commitment to professional excellence and their desire to make a difference for those who frequent our aquatic facilities. This award is distributed by Ellis & Associates, International Aquatic Safety & Risk Management Consultants. Only lifeguards scoring in the top 30% of the audit criteria receive this award. The National Register of Historic Places granted the designation Historic District to the Fort Wayne Park and Boulevard System because it was an "example of a comprehensive public space and transportation system developed from 1909 to 1955." Further, our Department was recognized by the Division of Historic Preservation and Archaeology for our Historic District designation and was given a Historic Preservation Award. 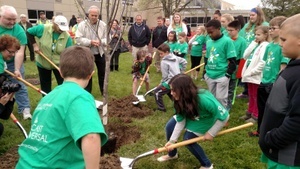 The City of Fort Wayne was named Tree City USA for the 22nd consecutive year. In addition, the Growth Award from the National Arbor Foundation was received again. The Growth Award is earned because a city meets a higher standard for urban forestry management activities. Fort Wayne was recognized on August 18, 2010 for being a Playful City USA community. Representatives from Turnstone Center, the League for the Blind & Disabled, Easter Seals Arc and the YMCA joined the celebration as partners with the Fort Wayne Parks & Recreation Department in this initiative. KaBOOM!, a national non-profit dedicated to saving play, recognized 118 cities across the country as Playful City USA communities, including Fort Wayne, which was selected for it’s outstanding dedication to play. Rick Hemsoth, PGA Professional and Manager of Golf Operations for the Fort Wayne Parks & Recreation Department, has been awarded the 2010 U.S. Kids Golf Master Kids Teacher Award. U.S. Kids Golf chose Hemsoth because of his "exemplary dedication to the growth and development of kids golf." The mission of US Kids Golf is to help kids have fun learning the lifelong game of golf and to encourage family interaction that builds lasting memories. The Northeast Indiana Association of Fundraising Professionals announced the 2010 Northeast Indiana Outstanding Philanthropist Award. The philanthropist awards are intended to recognize local people and organizations that donate time, expertise and resources to community development. *Jerry D. Fox was honored as outstanding philanthropist for his involvement in sports and youth-oriented non-profits for more than 25 years. He has helped improve the sports program at IPFW and the construction of Memorial Stadium and the establishment of Lifetime Sports Academy. *Taylor Reuille was honored as outstanding youth in philanthropy (K-12th grade), for her vision to bring a Boundless Playground to Fort Wayne. The playground will open next Memorial Day. ARCH, Inc. announced a certificate of commendation to the Fort Wayne Parks & Recreation Department for Outstanding Efforts to Restore the Building at Foster Pavilion #1 & Lakeside Park Sunken Gardens. Fort Wayne Newspapers 2010 Reader's Picks 1st Place Winner for Best Local Park-Foster Park. The City of Fort Wayne was named Tree City USA for the 21st consecutive year. Merit Design Award for the design of Robert E. Meyers Park from the Indiana-American Society of Landscape Architects. The CAPRA Board of the National Recreation & Park Association granted 5 year national reaccreditation to the Department. The Downtown Improvement District announced its Golden Broom Awards, which recognize outstanding maintenance. 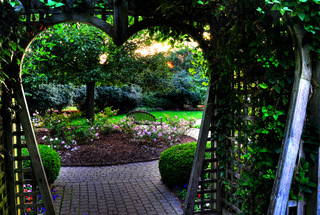 The Fort Wayne Parks & Recreation Department received two awards one for downtown landscaping and the other for interior and exterior campus landscaping at the Foellinger-Freimann Botanical Conservatory. Indiana Park & Recreation Association. Swinney Pavilion received a Facility Award. All-American Rose Selections, Certificate of Achievement for Outstanding Rose Garden Maintenance, Lakeside Rose Garden. The Indiana Arborist Association. Bill Diedrichs was honored with a Lifetime Achievement Award. Diedrichs is a 20-year employee at the Parks and Recreation and will be retiring as the City Arborist in August. Bill has made a big difference in the health of Fort Wayne's street trees over the past 20 years. He instituted a tree maintenance process in Fort Wayne that is a model for success on a state and national level. Tree City USA. The Department has received this recognition for the past 20 years. Growth Award, the National Arbor Foundation. The Growth Award is earned because a city meets a higher standard for urban forestry management activities. Great Men, Great Women Award, Bennie Lewis, this award is given to recipients who demonstrate commitment, service and leadership to diversity at IPFW and/or the community of Fort Wayne as well as met other criteria. Indiana Park & Recreation Association. Outstanding Park Facility award given for the new Swinney Japanese Pavilion in Swinney Park. Silver International Aquatic Safety Award from Ellis & Associates. This award is given to Department's that consistently exceed the Ellis criteria for aquatic safety certification. Tree City USA, The Department has received this recognition for the past 19 years. Growth Award, the National Arbor Foundation. Fort Wayne was one of only 14 cities in Indiana to earn a Growth Award. The Growth Award is earned because a city meets a higher standard for urban forestry management activities. Foster Park, 1st Place Winner in the 2008 Readers' Pick for the Best Park. Foster was chosen as the est park in Fort Wayne as part of the Fort Wayne Newspapers & FortWayne.com contest. Tree City USA, Department has received this recognition for the past 17 years. Silver International Aquatic Safety Award from Ellis & Associates, This award is given to Department's that consistently exceed the Ellis criteria for aquatic safety certification. Golden Broom Maintenance Award from the Downtown Improvement District. This award is given in recognition of maintenance at Freimann Square, Courthouse Green, Main Street Median and Foellinger-Freimann Botanical Conservatory. Essential Service of Health and Fitness Award for the Lifetime Sports Academy, awarded by the Indiana Park & Recreation Association. Volunteer Don Wolf, Outstanding Philanthropist Award, in recognition of his contributions toward Salomon Farm. Volunteers Tom & Marg Jehl, Outstanding Philanthropist Award, in recognition of their contributions to the Lifetime Sports Academy. Silver National Aquatic Safety Award, recognized by Ellis and Associates. This recognition is for consistently exceeding Ellis & Associates criteria for aquatic safety certification. Special Award, Indiana Park & Recreation Association, Kaleidoscope Showcase at the Foellinger Freimann Botanical Conservatory. Facility Award, Indiana Park & Recreation Association, Lawton Skatepark. Centennial, the Fort Wayne Parks & Recreation Department celebrated 100 years of service to the community through a wide variety of events.